Firstly I would like to thank Keces and Arthur from their USA distributor for arranging this sample for me to review. 1. High Quality Toroidal Power Transformer. 3. USB DAC: PCM 32 bit/384kHz and DSD DSD64(DoP)/DSD128 (DoP) DSD64/DSD128/DSD256 (ASIO Native). 4. 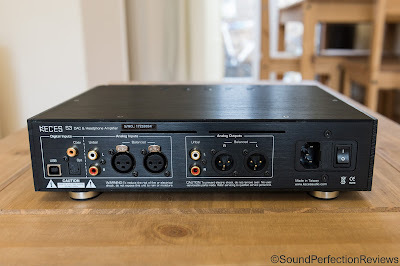 COAXIAL/OPTICAL DAC: PCM 24 bit/192kHz and DSD DSD64(DoP). 5. Placed Balanced/Unbalanced Headphone output: Max Output Power 2000mW + 2000mW@32ohms. 6. Placed RCA/XLR Input/Output interface: Could be a Preamplifier. 7. Volume Control System: 128 step attenuator. Accurate control volume to achieve left/right channel balanced. 8. Isolation circuit: Completely separates the grounding of the digital and analog sections. 9. Volume/Source/Sampling display using OLED has excellent visibility. 10. The 4mm thickness of the aluminum chassis to effective to blocks EMI/RFI interference. 11. The full-metal body realizes both vibration control and elegant style in an A4-size body that enables placement on a desktop to be a PC HIFI system or to be a small stereo system. - XLR_4PIN: SNR: >-120db 20Hz-20kHz A-Weighting. - THD+N: <0.00115% at 1kHz A-Weighting at 300ohms 100mW. - Frequency Response: 20Hz-20kHz (+0dB/-0.09dB). - 2000mW at 32ohms at THD+N=0.1%. - 1200mW at 300ohms at THD+N=0.1%. - 650mW at 600ohms at THD+N=0.1%. - 6.35mm: SNR: >-108db 20Hz-20kHz A-Weighting. - THD+N: <0.0015% at 1kHz A-Weighting at 300ohms 100mW. - 1200mW at 32ohms at THD+N=0.1%. - 350mW at 300ohms at THD+N=0.1%. - 175mW at 600ohms at THD+N=0.1%. The S3 came in a large brown box, with Keces embossed in gold on the outside; this was the shipping and main box. Once you open the box you will find the S3 held tightly in carboard inserts also wrapped in foam to keep it safe. In a separate small box you will find the power cable and remote. The box is nothing fancy, but it is sturdy and protects the unit perfectly during shipping. Accessory wise all you get is the power cable, USB cable and a remote; to be honest nothing else is really needed for this device. Build quality is superb, the full aluminium chassis is thick and hefty keeping the unit cool in use too, the inputs and outputs all use high quality sockets. The volume control feels very nice and the switches on the front are all very secure. The remote is also aluminium and feels very well made. No issues with the build quality, it feels like a premium product. Firstly you have a 128 stepped volume control, you can hear the click of the relays inside on every step, and it is easy to fine tune the volume. I really like the stepped volume control, a feature of a lot of high end products. This amp is designed for full-size headphones, and is not a good match for IEM’s, this does not bother me as most IEM’s do not require this kind of amplification. 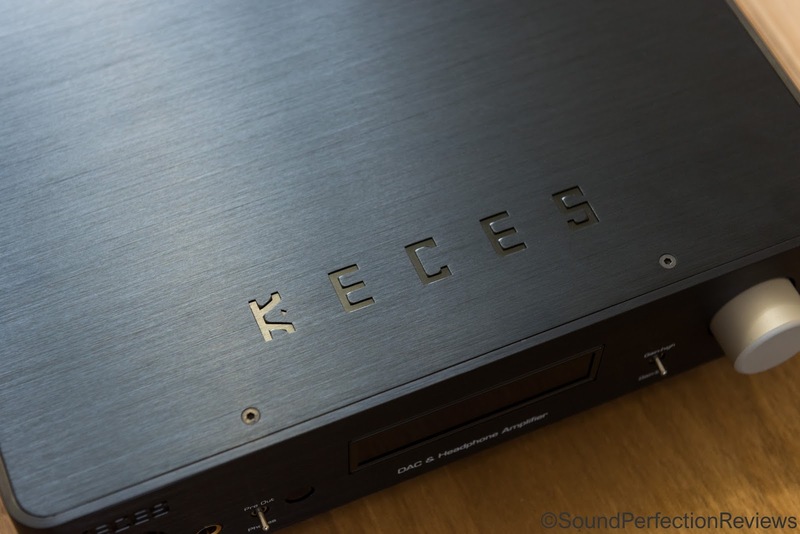 The S3 can be used as a pre-amp for power amplifiers (like the Keces S125). 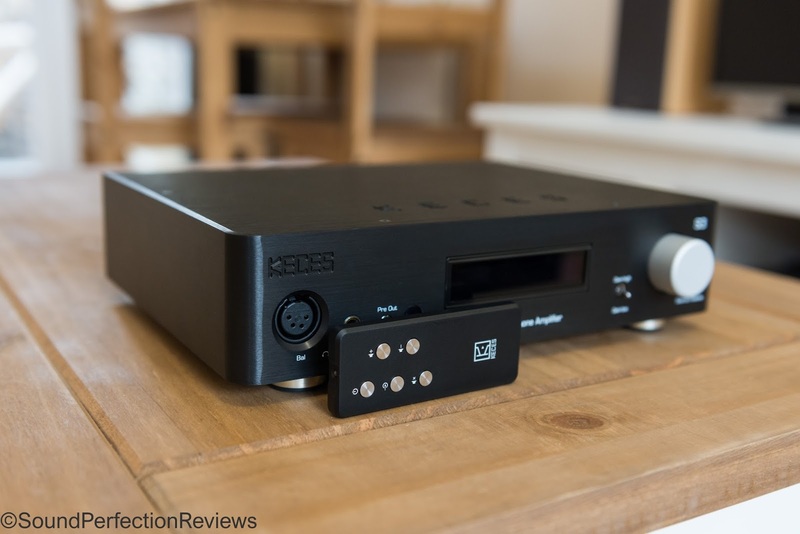 There are balanced and single ended analogue outputs and inputs, along with USB, Optical and Coaxial digital inputs. This makes the S3 a very versatile device that will fit into any system. The front screen shows you the input, sample rate, volume and gain setting, a quick press on the volume knob changes input and there are two switches on the front. One for high/low gain and another for headphone/pre-amp mode. I have been using the S3 as my main DAC/Amp for a couple of weeks now and will try and sum it up as best I can. First off the DAC is an ESS Sabre DAC, which some people associate with slightly harsh highs; I can assure you this is a well implemented ESS DAC Chip though. There is no Sabre glare with the S3, but it is not lacking in extension or presence in any part of the frequency range. I have been using my German Maestro GMP400 out of the single ended output, and the Ether Flow out of the balanced output. The GMP400 really scale up with good amplification, the S3 brings out so much detail in recordings but also the GMP400 likes the power and never sound thin or overly bright with the S3 (which they can with lower powered amps). With both headphones I never needed high gain, on the GMP400 I was at about 50-60 volume, and with the Ether Flow around 10-20. 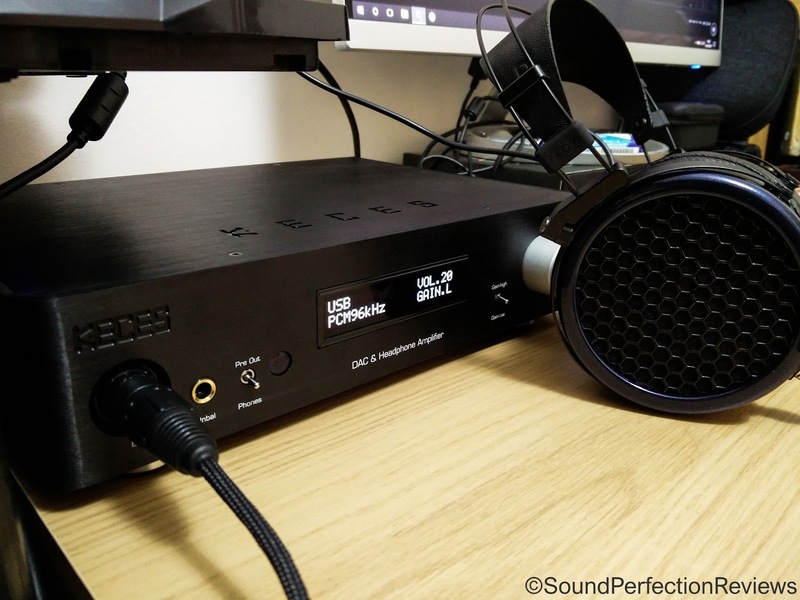 The balanced output is quite powerful and won’t have issues driving 99% of headphones out there. The S3 has an effortless sound to it, never sounding strained or lacking in dynamics, it can deliver thunderous bass with ease and without sounding muddy. Transient response is excellent (headphone dependent too). It has no issues driving the Ether Flow to ear damaging levels, and never falters with them. The S3 delivers a full bodied and tonally balanced sound, that is easy to listen to but at the same time there is so much detail. Micro detail is all there, soundstage is not artificially boosted however it is very well layered and separated. Even when driving low impedance loads like my Symphones V8 build, there is a sense of ease to the sound, it flows without restraint or added flavour. The sound is very linear but not boring and dry, never lacking in impact. This is where my Objective 2 amp falls behind. It sounds a bit too dry sometimes, lacking in dynamics that only higher end amps provide. Using the S3 as a DAC + Pre-amp, you get a very detailed and linear sound that has excellent resolution, micro detail and layering. 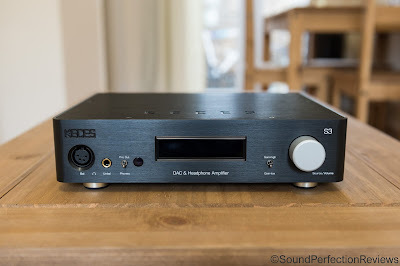 The quality of the DAC really is impressive, very open and airy but again without harshness. Using the S3 as an amp only again reveals what the amp section can do on its own, feed it a good signal and it sings with its effortless sound. I was worried the sound would be a little enthusiastic up top due to the LM49720 op-amps I saw in the picture, but this amp shows that implementation really is key to any component. There is no harshness but there is excellent clarity and layering. Notes have a very natural tone to them with excellent decay that just trails off into a black background. Conclusion: The S3 is a do it all device like the Oppo HA-1, but without Bluetooth and a fancy screen. The sound really is quite astonishing when coming from something that is lower end or more coloured. It has the capability to be neutral but not boring. In my personal opinion I find the Questyle CMA400i to be more reference sounding than the S3, but then on the other hand the S3 isn’t as smooth as the Sennheiser HDV820 which is a little too laid back. The S3 is engaging, effortless, dynamic and powerful. Yes there are amps that can output more pure wattage at this price, but few offer the flexibility of the S3, let alone have as good a DAC section. Did I miss the format compatibilities and price? Hi Micah, I'll update this :D initially I only put the headphone out specs and a link to the product page with the price.